It's more organized to keep all the submissions for a desktop background in one place, rather than cluttering up the /Intrepid/ folder of the wiki, so please put all submissions for default desktop backgrounds here under your own heading. I'm very new here -I don't even know if I'm editing this page correctly. Let me know what you think. The blends of blue used in this wallpaper are derived from the same colour palette found on our planet. Additionally, 70% of the human body consists of water. Although water itself is transparent, the great bodies of water enhance the blues in the skies by echoing the colours through the H20. Plain and simple, this wallpaper defines the Ibex as an animal who is determined, fearless and invulnerable to intimidation. Just like the operating system. The horns of this animal are rendered in this image with bold highlights and shadows, against a fresh background designed by me, specially for this piece. 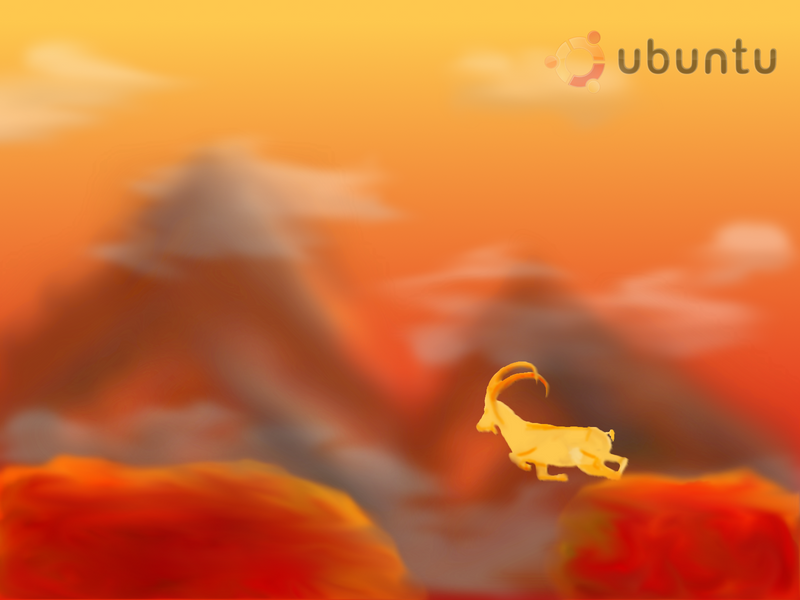 The eye of this animal has been given special attention to detail and makes the Ibex come alive on your desktop. I give you a wallpaper as futuristic yet simple as the operating system itself. I would be happy to answer any queries and suggestions at parthsarathitrivedi@gmail.com. Feel free to email me. A link to the full widescreen wallpaper is given below. I will be able to produce the wallpaper in a variety of resolutions if/when required. I did not create the Hardy wallpaper but really like it as well. I think that wallpapers in the style of the hardy wallpaper create a very distinct look, while still showing consistency over several releases. I started working on a similar wallpaper for Intrepid. So far it is just a b/w svg-image which was traced from a picture. The original picture from wikipedia commons by Nino Barbieri is published under GFDL as well as CC-BY. I actually don't know if that fulfills Ubuntus requirements as for a free license - can somebody let me know? I chose this picture because the horns are so nicely circular, reminding me of the circle of friends. I'm not sure if I should make the reference more clear in a final version of the picture. It is hard to repeat the artwork style of FelaKuti, so I figured I might get things started by making a line drawing of the frontal view of an ibex. Here is the result. I just could not find a frontal view online... so I looked at a few and used my imagination... apparently my imagination is not all that bad! I do not know how to make a preview of the drawing guys... could someone please somehow do it for me? This is based on a hand drawn sketch I made. I scanned and played with GIMP to make the colours and background fit, but it's far from complete. I hope that someone else will continue the work - everything is GPL'ed - just send me a mail (don[dot]s[at]yodanism[dot]org) if you want the source xcf or original scanned picture. Image is available in 3072x2304 and is very high quality. Who made this? Hobbsee (info on launchpad) would like a copy of this at 1280x800 resolution. Thanks! Made with Inkscape. It needs polishing, I'll keep updating it. I can't promise to do it very often though, I should been studying for my exams! I hope you like it. P.S. This is my first attempt at doing something like this, i'm just getting involved in this great community - so, sorry if it comes out wrong, etc! I was looking to find out more on what an Ibex actually is, and stumbled across the Wikipedia article (http://en.wikipedia.org/wiki/Ibex). I realize it may be a faux pas to hide part of the CoF, and if so, I apologize. Any suggestions or (constructive) criticisms are greatly welcome. Although I have been an avid fan of Ubuntu since way back in the 4.10 days, this is my first foray into the Ubuntu community. I hope it's well received! Not really a finished background. Inspired to give something a go by you guys. Thought it would be interesting to do an ibex not in profile but a more interesting view. I like the way that the angle gives the impression that the ibex is on the move. Please feel free to use and modify. I will probably combine this with a proper background at some point. Not really a finished background. combination of nature with ubuntu. I really like it! I changed it up a bit, and put it with the beautiful Dust theme, and GNOME's GION icon set. I'll attach a screenshot of it below. I planned on including the ibex horns somehow but as I went on I was unsure of how to incorporate them. Comment if you have any ideas. Maybe someone can use this as a starting point?